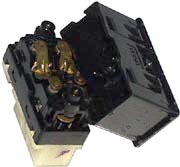 Today I want to discuss one problem that I had for sometime - electrical switch problem in a sunroof circuit. Problem: sunroof would open normally but wouldn't close. You'd have to play with the switch to close the sunroof. As my mechanic said it might be the cables problem in a sunroof mechanism, they might be old and need to be greased up. I did take the whole sunroof unit out of the car and took it completely apart including the electrical motor. Well, motor was a bit burned inside and cables (there are four of them) didn't have enough grease. While I was taking switch apart I was taking pictures to make sure I can put together all the small parts. Then I thought I might be wrong here but mechanism works great! When it was out the sunroof would open and close under its own weight, so it moves freely. 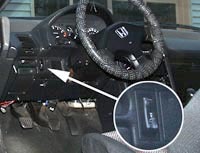 I decided to look at the electrical switch that is mounted on the dashboard (picture above). To remove it you need to pull it with a thin screwdriver or a kitchen knife. Now, when the switch is out you have to take it apart without breaking it.... You have to take it apart in two pieces. Inside you will find the actual contacts that got burned (sometimes real bad). The idea is to clean them and sand down the black stuff which prevents switch from working properly. Get some sand paper, fold it a couple times and sand both contacts. The ones on the body of the switch and the ones on the leaves that is inside of the switch. Once you finish with sanding and cleaning place leaves back inside, make sure they're in proper position (they are interchangeable so you do not have to worry about which one is which). Snap switch back together (you can't put it back the wrong way as it has a guide on one side). You're done with the switch. 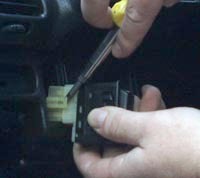 Connect it back to the harness and insert in a dashboard. Check the work of the sunroof, see if it closes just as fast as opens. If it does - you just saved yourself a couple bucks on a parts and labor!! I'm betting you saved me hours on this one. Nice pics helped out a lot too. Thanks, my crx body has 300,000 miles on it and the sunroof was working the same as yours until this year when the thing just stopped working. I replaced broken sliders and I tested the motor with a power supply to make sure its still good. Thanks to your post I have one less part to replace. 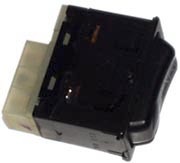 I have the same problem with my crx, ill push the switch but it will only make a clicking noise and it wont even budge open... so i tried what you told me to do but i cant get the dang switch open! I had that problem in my Si CRX, and it got stuck on me while it was raining, i was about to go look and buy parts, but then thats when i found ur post...now it works like a charm...i finally have my sun roof back...so my verdict is...this is the greatest advice ever for sun roof problems...thanks a lot. this is an awesome write up. the hardest part for me was taking the thing apart!! but once i cleaned those contacts, my sunroof worked much better. thanks! You are the greatest! I've had the same problem for sometime and made the mistake of opening the sunroof in my Si on this beautiful day and then it wouldn't close. With rain coming tonight I found your site and with your great pictures was able to fix it in a few minutes. Now I can enjoy great weather and stay dry when it rains. Thank you so much.